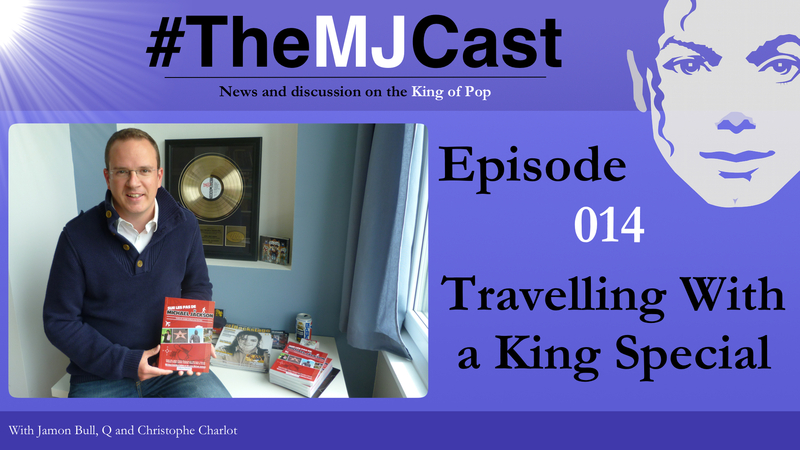 On this special episode of The MJCast, Jamon and Q interview author of the ‘Michael Jackson travel guide’ book Travelling With a King, Christophe. Topics include the book itself, his working relationship with co-author Antoine Cardinot, his fandom of Michael Jackson and the writing process behind the book. We also talk about Christophe’s French Michael Jackson magazine, MJBackstage, some of the intriguing locations mentioned within Travelling With a King and finally we delve into a discussion around Christophe’s views of places like Neverland and Hayvenhurst being considered tourist attractions. For purchasing Travelling With a King at a discounted price, make sure to visit this special website which Christophe has created specifically for listeners of The MJCast! Lastly, stay tuned at the end of this show to hear about various celebrations around the world for Michael’s 2015 birthday on August 29th! Visit this page of Travelling With a King’s website to purchase the book at a discounted price! The house featured in the Michael Jackson short film Thriller. Michael Jackson shopping at The Regis Galerie in The Venetian, Las Vegas. LMJ Magazine’s interview with the Christophe and Antoine, authors of Travelling With a King. The 1980’s unauthorised interview with Michael and La Toya Jackson at Hayvenhurst. Enola Lee’s website devoted to Neverland, titled Neverland – For Michael, For Love, Forever. You Are Not Alone – Michael: Through a Brother’s Eyes, a book by Jermaine Jackson. Information on Michael Jackson’s birthday weekend in Sydney, courtesy of MJ Book Club and the MJ Fans of Melbourne Facebook pages. The Hayden Orpheum Picture Palace in Sydney is set to celebrate Michael’s birthday with a special screening of Moonwalker! Walk the World for Michael, an annual charity event on Michael’s birthday which contributes funds by initiatives by the charity organisation, Michael Jackson’s Legacy. Cirque Du Soleil and Michael Jackson One are set to celebrate Michael’s 2015 birthday in style! Michael’s birthday celebration in Perth, Western Australia. Footage of Michael Jackson visiting China during the late 1980’s. This entry was posted in Specials, The MJCast, Uncategorised and tagged Antoine Cardinot, Belgium, Bill Whitfield, Books, China, Christophe Charlot, Cirque Du Soleil, France, Gary, Hayvenhurst, History, HIStory statue, I Just Can't Stop Loving You, Janet Jackson, Javon Beard, Jermaine Jackson, Katherine Jackson, La Toya Jackson, Las Vegas, Living With Michael Jackson, Michael Jackson, Michael Jackson One, Michael Jackson's Legacy, MJBackstage, Moonwalker, Neverland Valley Ranch, Oprah, Perth, podcast, Tanner Colby, The Jacksons, The Regis Galerie, The Venetian, Thriller, Travelling With a King, Unauthorised Interview, Walk the World for Michael, You Are Not Alone - Michael: Through a Brother's Eyes by Jamon Bull (Admin). Bookmark the permalink.